The primary, but not the only, application of this cannula is intra- and sub-retinal targeted administration of drugs and stem-cells to cure Age-related Macular Degeneration (AMD). The other pathologies such as retinal vein occlusion and retinal diseases are alternative applications of this technology. A catheter principle is addressing a serious clinical challenge in ocular micro-injection which is the lack of ergonomic positioning for inserting a bent-tip needle with appropriate position and orientation. To facilitate efficient treatment of both forms of AMD, ophthalmologists suggested targeted delivery of sub-retinal substances. The current utilities are not appropriate for such an injection; therefore the proposed cannula system is designed to address targeted intra- and sub-retinal injection. 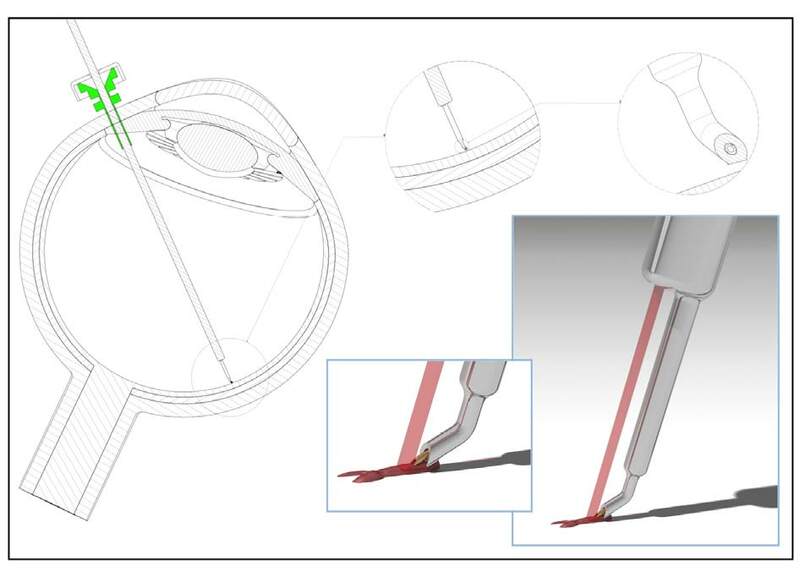 The subject of this invention is a method and a cannula for targeted micro-injection. This cannula is working with catheter principle, meaning that the operator will find the target, approaches the target and then fix the cannula. Thereafter, the catheter is pushed forward for injection, then the drug is released from a reservoir integrated into the device. A second channel acts as a guiding channel to help targeting. It is inspired by instrumental landing systems (ILS) in airplanes. Using this channel the operator will be able to fine-localize the cannula towards the target point. The guiding channel could be a physical laser pointer or a virtual beam created in an augmented reality environment. The invention is born at an ophthalmic operating room and from a common ophthalmic challenge. The technology has been already prototyped with larger diameter (20G) and eye surgeons tested the prototype on pig eyes under OCT integrated ophthalmic microscope. Two retinal surgeons are among the inventors of the technology and several surgeons have indirectly discussed the challenges which is directly addressed by the proposed invention. AMD patients are the first and direct target group with 8.7% prevalence among people older than 45. AMD is the leading cause of blindness in developed countries and know to be the main reason of suffering in the future. This is the only cannula comprising intuitive and ergonomic intra- and sub- retinal injection/suc- tion with only one degree of freedom (DOF) for catheter advancement. This feature enables very high precision. The technology has been already prototyped with larger diameter (20G) and eye surgeons tested the prototype on pig eyes under OCT integrated ophthalmic microscope.